The cycle of hair growth has 3 stages known as Anagen, Catagen and Telogen. When hair keeps growing this cycle is in a loop, but if the loop is broken and the Anagen stage no longer occurs then hair loss (or no more growth) is the result. Anagen – this is the active stage of growth where the hair follicles in the scalp produce hair and so the hair shaft grows. After a few weeks this growth stops and the Catagen stage commences. 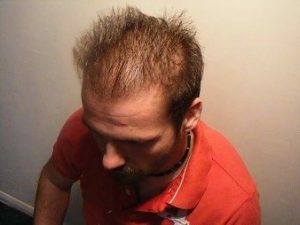 Catagen – at this stage the hair stops actively growing and the hair follicle begins to shrink and becomes detached from the hair shaft so preventing the hair from receiving any more nutrients. This hair shaft becomes known as a club hair. 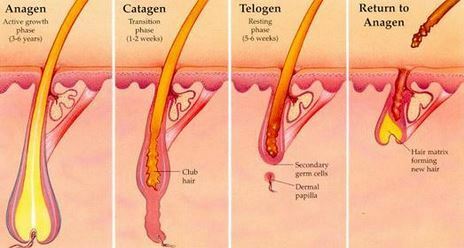 Telogen – After the formation of the club hair the hair follicle remains in a period of rest for approximately 100 days. At the end of this period the club hair will fall out and the Anagen phase will re-commence as the hair follicle once more becomes active and starts to reproduce hair. If the Anagen stage does not re-start then you will experience permanent hair loss.